Hello Everyone! Long time no post! I have been in Florida and I have been stitching and crocheting and framing Christmas presents while down here, so I couldn't show what I was working on! 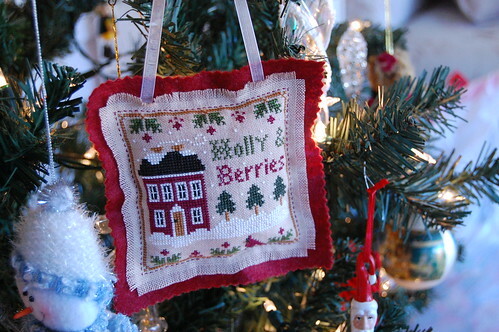 I finished LHN "Holly & Berries" into an ornament for my step-mom and I framed LHN "Heart of America" for my dad. The boys have been having a ton of fun! They had three Christmases. First with Chris's parents and then my mom and now my dad. I'm sort of over Christmas stitching, so I have been going through the stash I brought with me trying to decide what to stitch next. Hope you all had a very Merry Christmas! Write soon! and the Heart of America piece is absolutely amazing!! Beautifully framed! Glad to see you're back and of course have lovely finishes to show! What's Next? Can't wait to see! Your Heart of America is gorgeous, and the ornament is lovely. It sounds like you had a wonderful Christmas. What beautiful gifts, Nicole. So well made with love. I'm sure they were much appreciated. Welcome back from your Christmas break. Both gifts are just wonderful! And so beautifully finished and framed. I'm sure that your parents adore them. 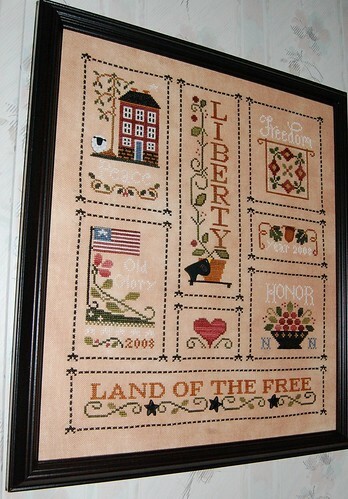 Nice stitching you have done, I like the Heart of America. Hope you had a great time when you were in Florida. We will be going to Florida next summer and I'm looking forward to it. Wow, both pieces are beautiful!! Thank you for visiting my blog and commenting on my work. Your Christmas gifts are amazing: pretty stitching and finishing! I read your comment about Christmas stitching yesterday and thought of you today while in the needlework store. There were lots of Christmas charts hanging around and I thought...naaaaah. Love that Heart of America! I have it all kitted and ready to go thanks to you! Happy New Year Nicole...enjoy your family!